The Lunar Chinese New Year is arriving in a month’s time, and we thought it’ll be fun to share one budget CNY video and one luxurious CNY video with all of you. If you’re wondering what PoTeyToh represents. Well, fellow blogger Tey Cindy and I are working together to build a new brand – PoTeyToh. This new platform will be filled with a couple of video series which offer you an insight into living in Singapore. We’ve just published our very first video on how to celebrate the Lunar Chinese New Year in Singapore on a budget. Pretty sure our mouths will be either busily chatting and catching with relatives whom we only meet once a year or greedily munching on all the Chinese New Year snacks. Do comment and let me know what your favourite Chinese New Year snack is. For me, the salted egg fish skin and pineapple tarts are very addictive! However, salted egg fish skin can be very pricey, especially during the Lunar Chinese New Year period. So, instead of buying, why not make your own salted egg crab sticks? As compared to paying $20+ for a big packet of salted egg fish skin, we only paid $11.70 for both ingredients and the DIY festive packaging. 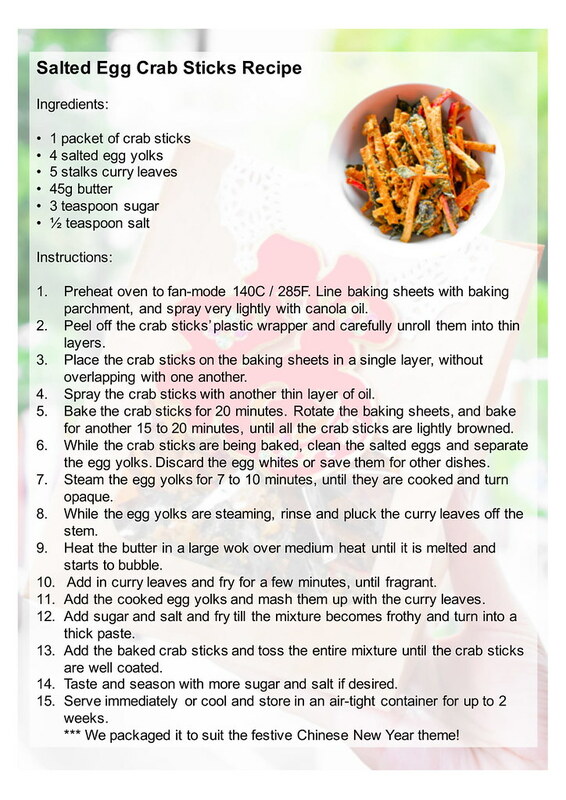 To keep this post short and sweet, check out our homemade salted egg crab sticks recipe below. Do like and follow us on Facebook for more videos!